Adding to a rapidly growing professional racing program, eEuroparts.com ROWE Racing will expand to include the full 2019 season of TC America with the SRO World Challenge America racing series. Formerly known as Pirelli World Challenge, the newly revamped TC (Touring Car) America will offer up a 40min sprint format, rather than the 2hr and 4hr endurance races in the IMSA Michelin Pilot Challenge. With this announcement pairs the addition of a new Audi RS 3 LMS to the eEuroparts.com ROWE Racing squad, to be specifically configured to run in TC America competition for the entirety of the season. The SRO TC America TCR category features two 40-minute sprint races during each weekend of the eight-round championship. New to this year, the TCR DSG Cup will serve as a sub-class within TCR, limited to cars with the production based DSG transmission versus the sequential transmission. The DSG Cup will feature its own championship made up of Bronze rated drivers, complete with separate podiums and scoring. 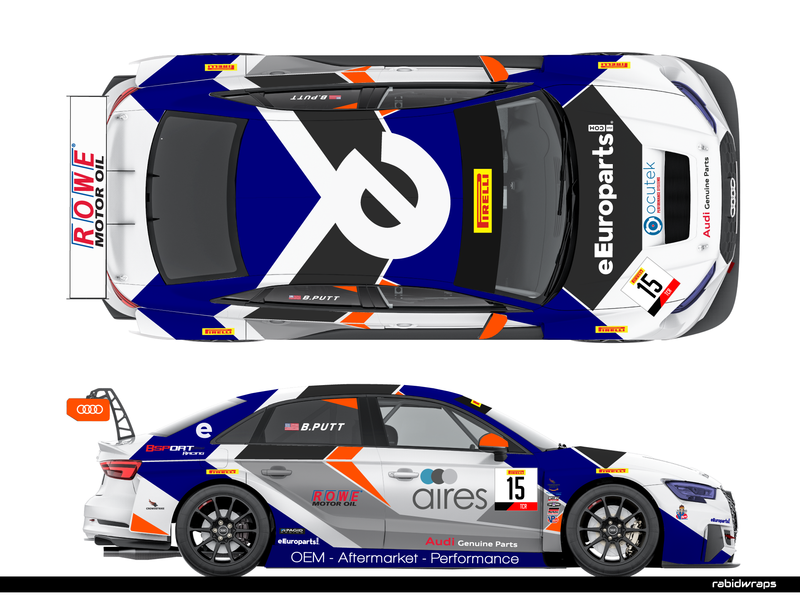 The #15 eEuroparts.com ROWE Racing entry will feature an Audi RS 3 TCR car driven by Bryan Putt in the TCR DSG Cup, sponsored by Aires, BSPort Racing, and OcuTek. After a 12-year hiatus, Bryan re-entered the racing world and spent the past three years developing his skills at the club level. The outing included a win in the NASA Super Unlimited Championship Race. Now he feels ready to take the step up and put his skills to the test as he enters his rookie season in pro racing. The season will kick off with at Circuit of the Americas March 1-3, 2019.